Pixar movies are always great, aren’t they? Progressively over the years, they’ve gotten not only better at animation but at story telling. 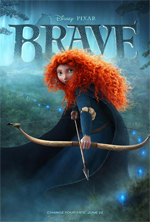 And while I’d love to say that trend continues with Brave, I can’t. While there’s nothing epically wrong with Brave, it just didn’t keep the tradition of making both kids and adults laugh. At least not for me. Don’t get me wrong, it has its moments. I laughed out loud quite a few times. But Monsters, Inc it is not. There’s a number of things that Brave does well, including the animation. There’s a couple of scenes there there’s flowing water of some kind — a scene where it’s raining, and the water is running down the outside of the castle, and a scene where Merida is playing in a stream, catching fish — where the water was so lifelike that I thought it was real water superimposed over the animation. Historically speaking, water has been one of the hardest natural elements to animate (along with fire), so Pixar’s spot on water creation reminded me a lot of the first time you see Sully’s hair blowing in the breeze in Monsters, Inc. Pretty impressive. Where it doesn’t get it right is the story, at least not for me. While it’s a heartwarming tale of a mother and her daughter, that’s not something that I can relate to. You know, being a guy and all. I went and saw this the second day it was open, and I was actually kind of shocked at how few people were in the theater. I would have loved to have gauged how much kids like it based on their laughter and giggling. But since there were very few kids at the screening I attended (6:45 on a Saturday night), I can’t say whether or not kids enjoyed it. I certainly enjoyed the movie, don’t get me wrong. I especially enjoyed the La Luna short before it (possibly more than Brave itself.) It’s a cute film that looks aesthetically stunning, and was my first natively shot 3D animated movie, so that was fun. It just wasn’t Pixar’s best, in my opinion. If they were going for heartwarming and cute, they got it. If they were going for laugh out loud and leave smiling, they missed the mark. Christina Joyner Patnode liked this on Facebook.